Since I love lighting and am fond of incorporating eco-touches into interior spaces, this latest post brings you the best of both worlds – a collection of light fixtures created from upcycling, repurposing and green tech! The styles run the gamut, from minimalist contemporary, to old world elegance and into flights of whimsy. There’s something for everyone. So enjoy the lighting fixtures and drop me a line on your thoughts! A festive piggy (or wild boar) to literally brighten up any child’s room! 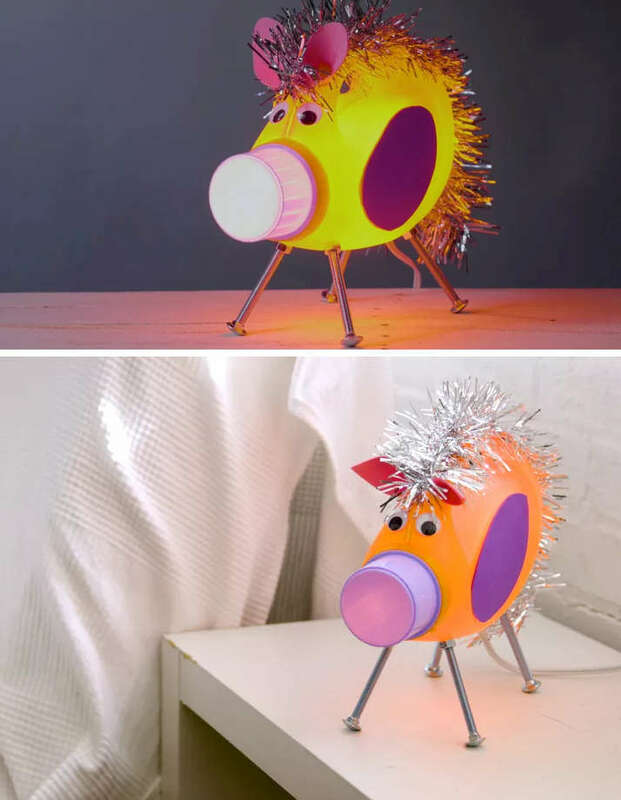 This colorful table lamp is actually a repurposed detergent bottle sporting a garland ‘updo’ and festively decorated with foam papers and googly eyes. While I usually don’t cover DIY projects, this one is so totally adorbs that I can’t resist it. Anyone interested can check it out at The Spruce. 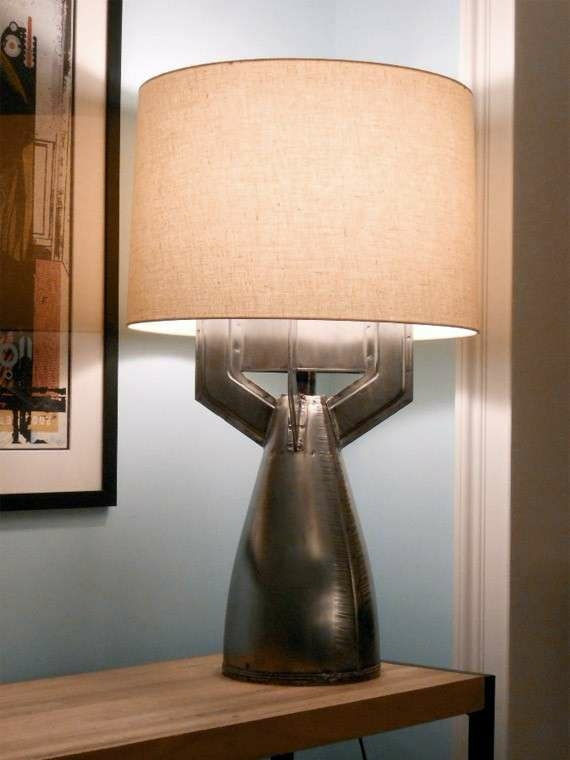 Cool table lamp that boasts an aeronautical pedigree. The base of this light fixture once torqued a 1940’s seven-cylinder radial engine for Jacobs Aircraft. 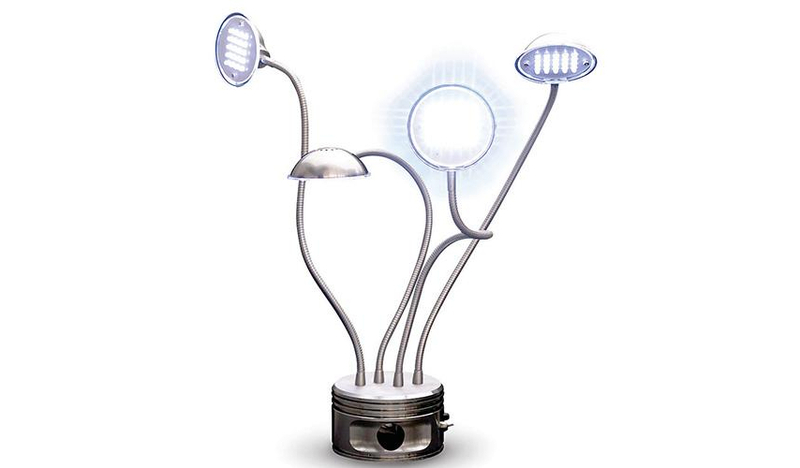 The LED light bulbs in the gooseneck lamps keep maintenance to a minimum. Alternatively, an architect’s swing arm lamp with halogen bulb is also available. A wall sconce any vinyl buff would appreciate! 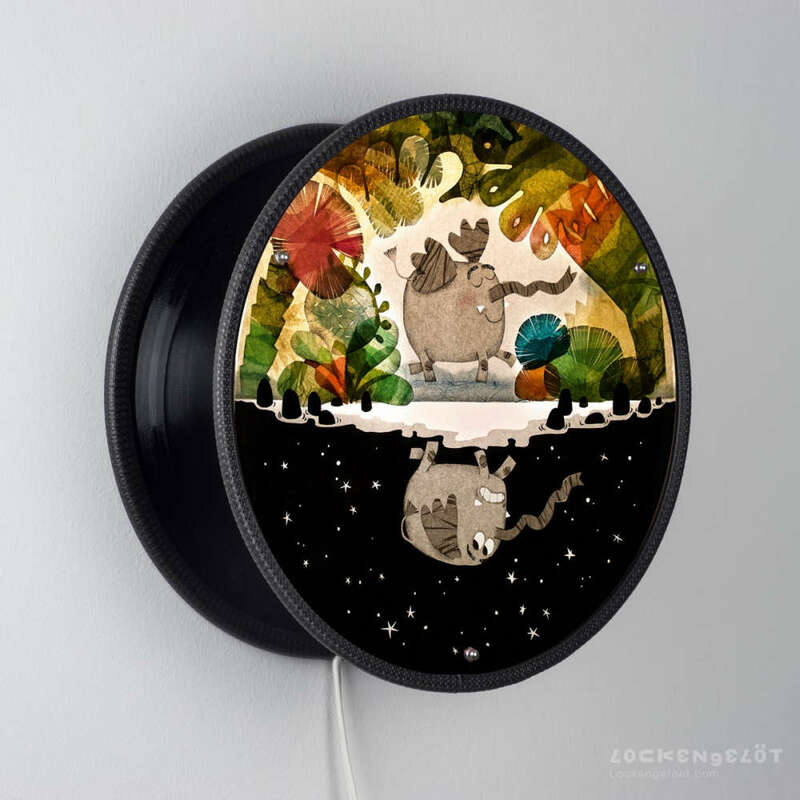 Handcrafted in Germany, each light fixture is about 12” in diameter and houses 3 recycled vinyl records mounted on an acrylic disc. The fun part is to pick a cover design. There’s a slew of artistic illustrations spanning a variety of genres, though children’s illustrations are my favs. Lockengelöt now offers personalized designs – using digital CMYK printing, it takes your hi-res jpg and turns it into a custom light fixture just for you! 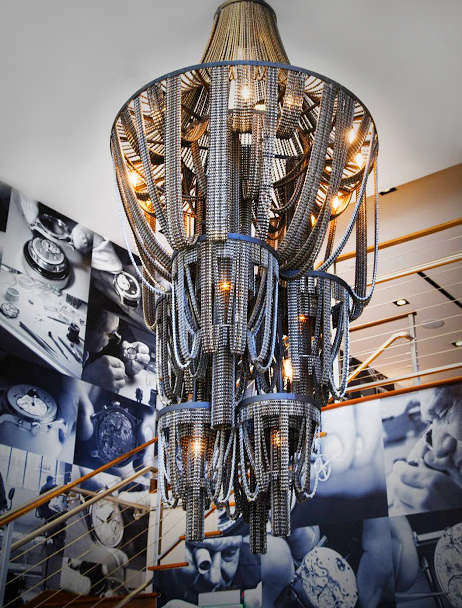 Hard to guess this stunning chandelier is made from lowly bike chains. Carolina Fontoura Alzaga of Facaro creates masterpieces of functional art through her Connect series. The 33 styles range from 1 to 10 foot high and 1 to 4 foot in diameter. Each of her reclaimed bicycle chains are degreased and left in its original state. Chain finishes are available in copper, brass, and black nickel to achieve a variety of effects. 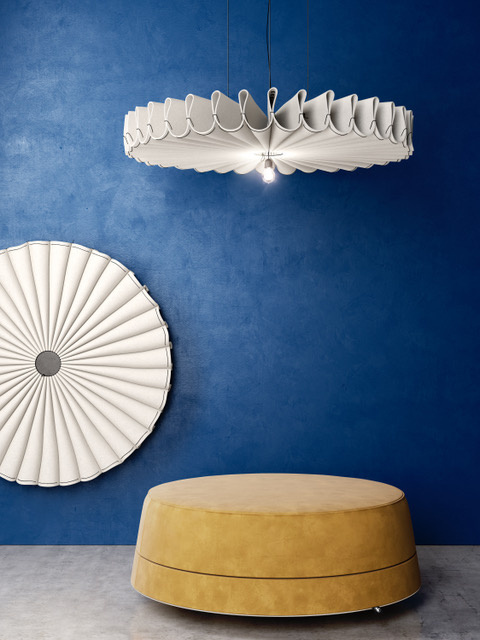 A multi-talented suspension fixture that doubles as a veritable cone of silence! BuzziFelt has excellent sound absorption properties and is sustainably made from 100% recycled plastic bottle waste. Austrian firm 13&9 Design fuses traditional sewing techniques of pleating and smocking with acoustic principles to create large, lightweight, sound-absorbing LED pendants. It’s all the more impressive to know the 39” and 59” round dimmable fixtures rely solely on their elaborate pleats to provide structural integrity. Truly versatile, they can be installed both vertically and horizontally based on need. Light fixture with a translucent shade made from rattan. Patented green tech creates a lightweight, sturdy material out of the hollow centers of rattan palms. 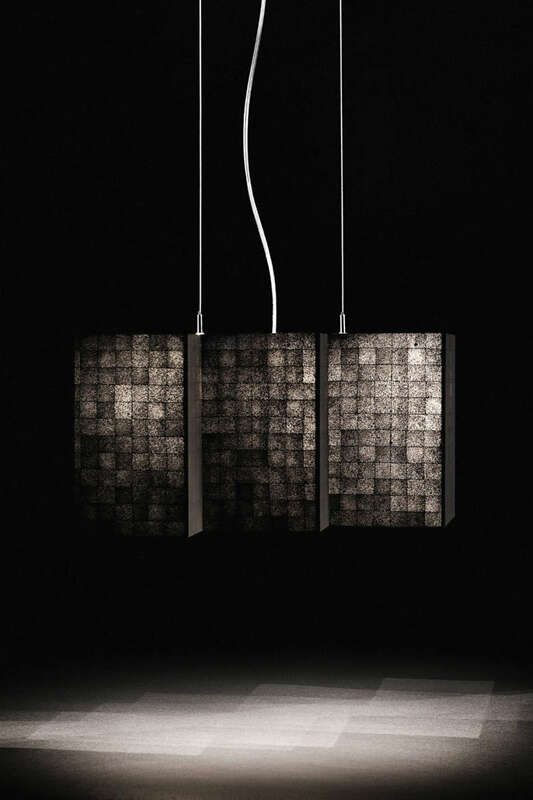 The resulting product is a porous veneer that allows easy passage of air and light, making it a great candidate for light fixtures. In fact, it’s the densely packed rattan capillaries in the veneer that create this lampshade’s intriguing visual texture. Ever wonder what it’s like to light up a bomb? This is your chance! Not everyone can claim to have a war relic in their house. Brooklyn-based Stockpile Designs has news for you! 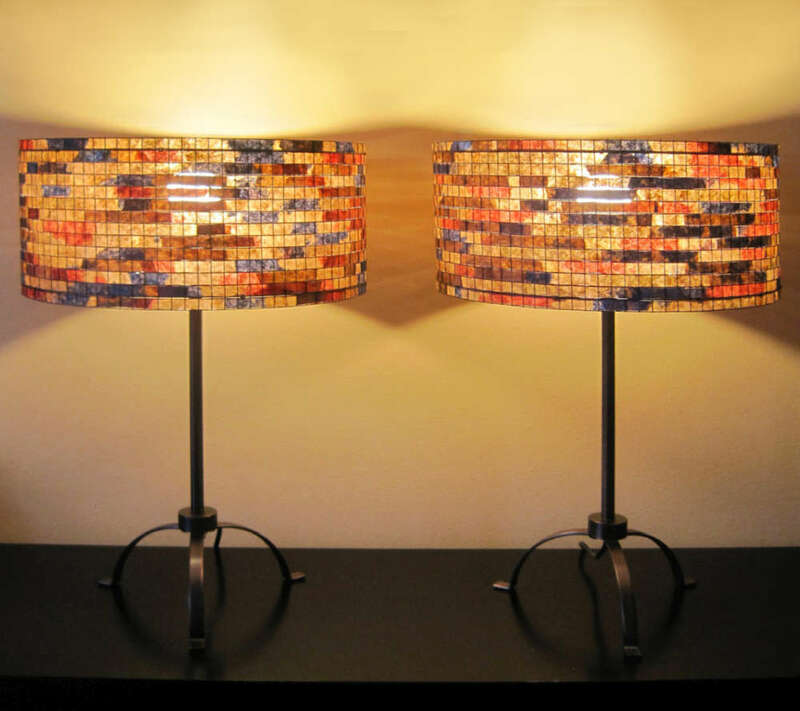 It takes surplus ordinance and upcycles them into table lamps. Megaton bombs from the Korean War and WWII practice round missiles are all fair game. Go on – enjoy the blast of light and make your day! Brazilian artisan Vilma Farrell repurposes used coffee filters and transforms them into beautiful lampshades for ceiling, table, and floor lamps. After the filters are cleaned and dried, they are either dyed with water-based paints or left natural, depending on the design. The paper is hand cut and woven into the wire frame for a mosaic, collage look. Eco-brutalism? Here’s a chandelier that celebrates eco-consciousness and raw industrial chic at the same time. 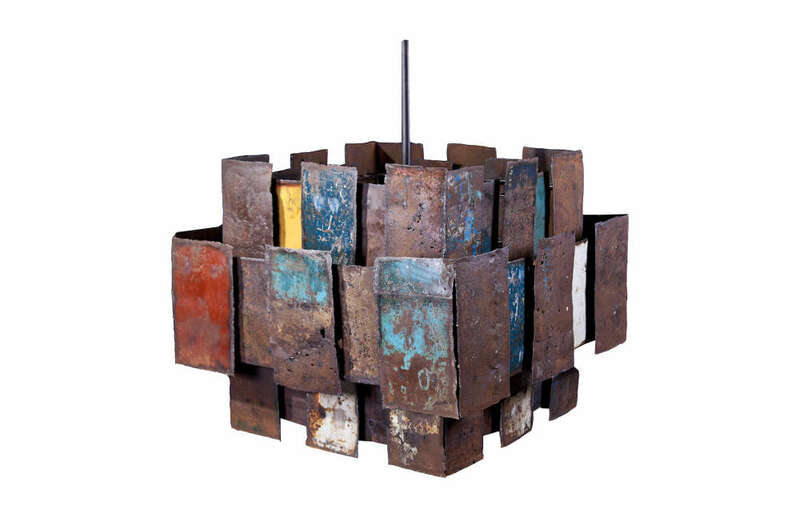 The weathered steel pieces are reclaimed from painted oil drums. Each time-worn plate shows the imprint of weathering in its own way so no two fixtures are alike! This entry was posted in Green Design & Construction, Lighting and tagged Ceiling Light Fixture, Chandelier, Eco-friendly, Lamp shade, LED Lighting, Lighting Fixture, Pendant Light Fixture, Rattan, Recycled material, Renewable Materials, Repurpose, Sconce, Sustainable Design, Table Lamp, Upcycle, Wall Lamp by Marie Chan. Bookmark the permalink.